I wanted to share this super quick and easy tutorial with you today because changing your blah and boring default folder icons to custom, awesome icons WILL change your life. I’ve been doing this for years and it really does make work a bit more fun especially if you do a ton of computer work like I do! Best part is you don’t need anything fancy to make it happen! Watch the tutorial below. I’ve rounded up some affordable, adorable or otherwise likable options for you to use for your icons from Creative Market below. Remember you can use just about any image and you could definitely spend an hour or more browsing all the amazing options CM has! The benefit to buying a set is that your icons will maintain a similar look and feel and appear more uniform and organized. If you buy a set with lots of icons in it you’ll be set for a while if you create lots of folders. Be sure to read the descriptions on these or any other sets or items to be sure they suit your computer’s abilities. If you don’t have a program like pixelmatr to open the .eps files in to isolate the images if they come on a single sheet, look for sets that have individual elements. Do also note these are affiliate links. Here is the radical 80s set I have on my own computer! I love this set of stylized jungle animals. This would be perfect for you animal + color lovers. This set of circle icons has a little bit of everything. Would be great for those of you who want your icons to thematically align with your folder names as there is bound to be a match somewhere in this set of 250 icons! Do note this set is a bit more expensive. This sleek water drop set is ideal for minimalists. Let me know which set you choose! As you all know, I love instagram and I love seeing creativity in progress. I also sort of love hashtags. This year I have been using my own hashtag, #creativelifehappylife and I am now inviting you to use it as well! Why? Because I know that part of feeling confident and empowered with your work is having others recognize your unique genius and creativity, and also, when people share your work because it’s awesome! So that is what I want to do – see your work and share it! I will look through this collection and pull images to share throughout The Council – here on my blog, on my own IG, or in my newsletter (of course will ask permission before reposting outside of IG.) This is just a fun way to get your work out there a touch more. If you haven’t yet seen my other collection of hashtags for sharing creative work on Instagram, check it out here. PS. My friends at Aeolidia have 260 blog post ideas for creative shops on their blog today. This is a huge topic – so this is part 1. The more I discuss it with people, the most I think needs to be added. So please bear in mind that this is a preliminary run down. There is room for more thought and fact here. I would also like to say that I don’t HATE Etsy. I think Etsy has pros and cons and those pros and cons change depending on what you are selling and at what point you are at in your business. They have made a lot of very positive changes over the years I’ve been there and Etsy is basically the reason I’ve been able to do what I do for the past four years. They’ve added an on site credit card processor, made it possible to list large quantities without paying upfront for listings, hold in person events that bring their community members together and made it possible to print shipping labels for your orders. All of these are great additions. There are plenty of others. It might be worth reminding you that I had a crazy year in my personal life, and I know the impacted my work to some extent. But I also know that I worked hard through out the year and maintained the same level of attention and interest in my Etsy shop. At the end of the year, I began to really focus on driving traffic to my site – but I maintained my Etsy practices as well. But with the good there is some not-as-good. And it’s no surprise to anyone that Etsy isn’t perfect. On friday evening, I began tweeting about some of the issues I have either been experiencing or have witnessed happening in relation to Etsy and Etsy sellers. Most of it was not positive. My rant – as I’m okay with calling it – was brought on by a comment I saw (not the first) about how Etsy sellers are basically just sitting around complaining, not bettering their situations, and blaming everything that is wrong with their lives on Etsy. I cannot believe how small minded some of these remarks that I keep seeing are. Two distinct things happened on Etsy in the late summer/ early fall – seems these two things, in addition to some preexisting elements, really brought about this buzz of unhappiness amongst a great number of sellers. 1. the design of the front page changed – drastically. 2. some not-fully-explained changes happened to the search algorithm and (I think these were put in place to fully support) the new “ad” listings – a paid promotional opportunity within etsy. These changes caused problems for many of the sellers I know – and there are quite a few people making their displeasure known on the forums. Are you one of the sellers feeling less than thrilled with these changes? Etsy admin themselves even acknowledged that sales were slow and views were down. For them to do this said to me that it could actually be a bigger deal than I originally thought. I’ve heard a number of truly unreasonable – and honestly disrespectful – things said about the sentiments of sellers who are making it known they are not happy with the changes or their subsequent consequences. I would like to address those remarks that I feel are small minded and unreasonable – because clearing these misconceptions up will help foster a civil discussion about the issue, which I would like to do. Because if we are going to talk about this, we can’t have these remarks coming up over and over anymore. They aren’t helpful. “Don’t put all your eggs in one basket” – really? In theory this is a valid concept. Diversify, sell in multiple places, etc. But does this really serve or add anything to the conversation at the moment? Most people have one job or are employed by one entity. Do we scold these people for putting all their eggs in one basket if they get laid off? No. Holy crap, no! We wouldn’t dream of it. (Can you imagine?! ‘oh you thought having one job was safe? ha!’) So why do we scold etsy sellers – who have doe well and had a reliable and consistent income from their shops there -when they express a concern about changes that impact their income? I just don’t think this is an okay argument. Even if you are diversifying, it is very natural – and almost essential to a certain extent – that you put more effort into the place the brings you the most return. Which makes it hard to diversify to the point of establishing another equally viable revenue stream. Some people have done it, but it’s not easy. I know for me, it has been hard to focus my plans elsewhere because my shop was so busy, and I am one person, and I can’t do everything, so I tended to stick with what was working. So please, stop saying this – it is not reasonable. Next thing I keep hearing is “Etsy is a business / not a democracy.” When people say this, do they really think they are educating others? Everyone knows that Etsy is a business. Their business is to provide a marketplace of vintage, craft supplies and handmade items. I don’t expect Etsy to be perfect, I don’t expect it to stay the same forever, and I don’t expect that just having my items listed there will mean they sell like crazy. I do, however, expect an honest, human-answered, straightforward, timely response to a public outcry – or, to a personal email. Meanwhile, this thread – started by Etsy admin – has gone over a month with no response. “It’s not up to Etsy to make you money / Etsy is just a platform.” Certainly. But we could argue that it IS up to etsy to provide you with what you pay for which is a marketplace free of resellers. It’s a hot topic – or in some cases, a blurry line. In other cases, it’s not blurry at all. But there is no denying that Etsy actively maintains that they are just as against resellers as the rest of us. This is a dead horse already, but it is worth noting. The issue I think is that what many of us consider to be authentically and responsibly handmade is not necessarily fully in line with Etsy’s definition of handmade, which seems to keep expanding to encompass many types of products and businesses. But if a product is truly just being resold in massive quantities, in theory, we are all in agreement that that should not exist on etsy. Opinions of how well this is being reinforced are varied. The reason this is an issue is – as far as I can tell – twofold. One, the more reseller-y type products on etsy, they more degraded the original concept and expectation set up by Etsy over the years becomes. And two, true resellers have massive amounts of product on hand – they can up their quantities, fill orders quickly, tend to have professional photos, list tons of items, can sell cheaper than a handmade item, etc – all of this makes less space for the genuine handmade products. Please keep this thought in mind as I move to my next point about the recent changes to search. “No one is forcing you to stay here. / If you don’t like it leave.” I have to admit, in the past, i’ve had this exact thought. If you are truly unhappy and dislike nearly everything about a place, don’t stay. But it’s not very helpful to say that. People know they aren’t being held hostage on but there is a lot that goes along with closing your shop entirely. If you have invested a decent amount of time building an audience, or creating listings, making connections, etc – it is difficult to just abandon that. Likewise, bearing in mind that we don’t know everyone’s skill level or available capital, it’s not really our place to suggest that someone else just go ahead and move to another platform. There is a whole lot of learning that goes into making your shop on etsy work, and when you go full time with it, it’s no small investment of time or energy. Just imagine having to forget all of that and start over. It’s intimidating. Not to mention, if you have any shred of optimism, you’ll keep giving it more time. Additionally, you’ve probably got a decent amount of money invested. Some of the benefits of Etsy are that they foster a community, you can save your favorites, shop multiple vendors in one go and they bring in a ton of traffic – things that would be hard to replicate on your own. So please, know that people understand they don’t HAVE to stay- and have probably considered moving on – but it’s not as easy as it sounds when you have years of history, back links, customers, connections and know-how wrapped up specifically in Etsy. So this page sort of gives me the impression that they want me to go and search, rather than browse categories AND shop “socially” based on my feed. It’s not super cohesive and by hiding the categories, it makes the experience a bit more confusing for the average user. How do I know this? Because once this came into play, my friends started texting me asking how to find things on Etsy. These are young, internet savvy friends of mine. They are very familiar with online shopping. Since this page really seems to support a search rather than category browse shopping experience, it comes to mind that you better be on your search ranking game as a seller. I decided a long time ago that it really doesn’t make sense to pay to advertise an Etsy shop off-Etsy. I haven’t really done any paid promotion within Etsy, so I can’t speak from experience there. But if I am going to pay for advertising on a blog, for example, I’m sure as hell not going to send that traffic to Etsy. There are like, 50 million ways a person can click right on out of your shop on Etsy. Your much better off directing traffic to your own domain. 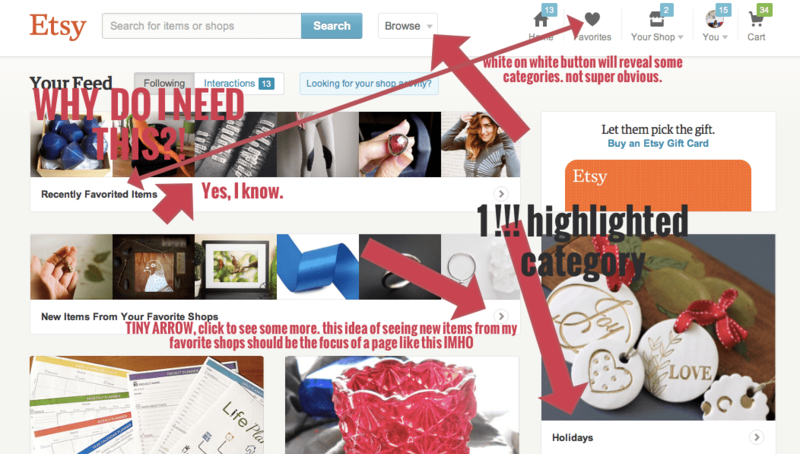 Free promotion like Pinterest suits me better for promoting Etsy. So this is why I tend to focus more on appearing in search. This has always been my game plan and approach to Etsy. The changes that were made to search recently are not completely clear to me, I don’t think there has been a definitive run down of the changes or what exactly for sure goes into the algorithm regarding an item as relevant. You want your items to be as “relevant” in a search as possible because that’s what gets them showing up closer to the first page of search results for any term you might be optimizing for. At the end of the summer, I saw some of my strongest listings – that would often show up within the first 5-6 pages of a search- fall into obscurity overnight. Literally, one day they were there on page three, next day, nowhere within the first 30 pages. I have to think that’s not just a ME thing. This indicates to me that a change had taken place in the algorithm – and it did. Another indicator to me that these changes were not playing in favor of my shop at least : there were no discernible patterns in my shop stats anymore. From day to day the top keywords would change. If on a wednesday my top keyword phrase was “initial necklace” – on thursday, it was not even in the top six. I have always been very aware of my shop stats, so I noticed this immediately. Another thing I noticed was that I would get lots of hearts on items that had sold a long time ago. I let it rest for a while to see how the “testing” would play out, but by the end of October I was really starting to get annoyed with the lack of consistency. Oddly enough, at this time I was asked by Etsy admin to write a post for their Holiday Bootcamp about shop stats, keywords and the like – and how to bring all that together and understand it as the holidays approached. I was surprised by this because i really didn’t think I was “doing it right” anymore at that point. Even though I thought her invite was enough validation that I must have some clue what I was doing, I asked the admin who invited me directly – because I would not want to advise any other seller on something if I had it all backwards. She assured me I was doing everything “perfectly” in terms of keywords and such. I felt better, but I was more confused than ever. If it was something I was doing wrong, I could fix it! I dove in and got my research on. I read and reread a lot about SEO within Etsy and made a bunch of changes that were basically just expansions on the things I already had in place. Meaning, I didn’t take on a whole new approach, I just tweaked and tightened up some things. And I did see some improvement after that. But it’s my personal opinion that overall traffic was down on the site – maybe because the new front page doesn’t draw in as much browsing as the old one? Maybe it’s more granular? Maybe people suddenly just don’t like my stuff? I’m not sure. This is a huge topic, and I know it’s worth discussing because across the board my numbers are down. And I know for a fact that other people’s numbers are down. I am very happy to acknowledge that Etsy has every right to change their ways and formats and do as they’d like. But I am also entitled to my opinion on those changes. And I also think that if those changes are negatively impacting me – or anyone else – we are allowed to be upset about it. Think of it as leasing a car. If your normally very reliable Honda that you count on to get your to and from work, suddenly stopped running you would be annoyed. You would take it to the dealership and you would expect them to have some answers about what was wrong/ how to fix it. You would be frustrated that this thing you are paying for, and have no just-as-good back up for – you would be annoyed. You know you would be. So please be respectful when discussing this issue with other sellers. The solution to this will be different for me than it is for you or someone else. I like having a presence on Etsy. I also enjoy the freedom I get by selling on my own site. There are plenty of ways to approach the next steps. My shop is currently on vacation while I take some time to gather my thoughts for the new year and finishing up my open orders. I fully intend on reopening my shop after the holidays, but my focus will be on my site and on some new projects I am working on. I would love to hear your thoughts and experiences with Etsy this year!